Crafted of rustic wood and black powder-coat metal, this industrial-inspired wall mounted wine rack will create storage and a decorative way to display your finest wines. A top shelf, with metal bar, helps bottles stay secure, while allowing you to store up to five wine, champagne, craft beer, or liquor bottles. Four large stemmed glasses easily slide into the bottom of the rack for quick access for those freshly uncorked bottles. With an elegant yet modern look, this hanging wine bottle and glass holder is ideal for any restaurant, bar, winery, cafe or simply in your home. SPECS: 8.3 H X 19.0 W X 5.0 D (in inches). WALL MOUNTED WINE RACK: Industrial inspired rustic wood and black powder-coated metal wine bottle and glass rack. 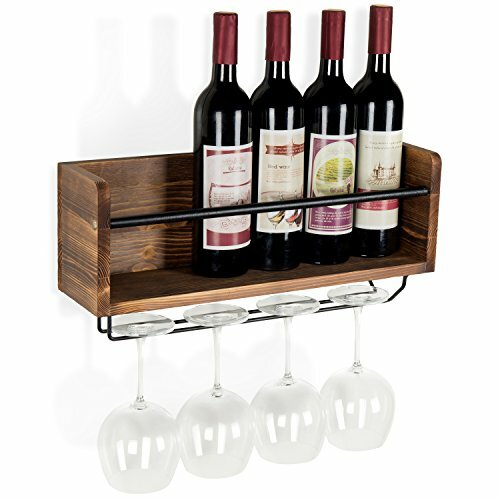 BOTTLE HOLDER: The top shelf with metal rail can hold up to 5 wine, champagne or liquor bottles with ease. GLASS STORAGE: Glasses conveniently slide in from the side and allow 4 large wine glasses to be stored. FITS ALL DECORS: Wonderful for storing wine at home, in a restaurant setting, at a winery, bar, or cafe.